A computational model of heat- and mass-transfer processes in a phosphorus recovery electrothermal reactor has been developed. 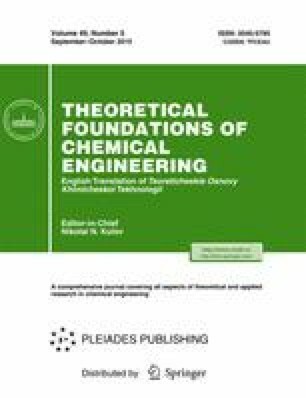 An algorithm of the numerical method of finite elements has been proposed for the computer-aided simulation of heat- and mass-transfer processes in the reactor. A comparison of computational experiment results with experimental furnace inspection and physical modeling data demonstrate quite satisfactory agreement. The computer-aided calculation of related thermohydraulic fields has been performed for the entire reactor volume for the first time. Original Russian Text © V.P. Meshalkin, S.V. Panchenko, D.S. Panchenko, V.V. Men’shikov, A.S. Kazak, 2015, published in Teoreticheskie Osnovy Khimicheskoi Tekhnologii, 2015, Vol. 49, No. 5, pp. 510–516.